Larger than the hot-selling Santa Fe Sport, the 3-row 2015 Hyundai Santa Fe appeals to those with a need for more seating, more power and more towing ability. 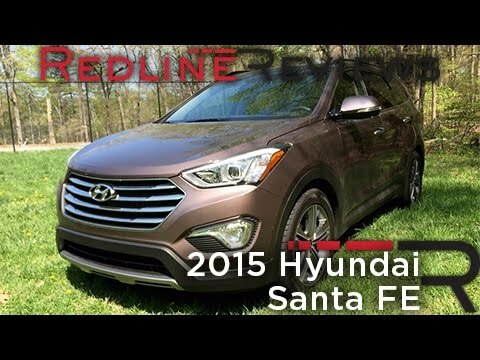 With its sophisticated good looks and high-end features, the Santa Fe should have the competition feeling the heat. Rising resale and reliability ratings also bode well for future buyers. A great, practical car-perfect for Minnesota winters and long commutes. I love my Hyundai Santa Fe! I like the space that it provides the driver and passengers. I can easily access every area of the vehicle from multiple places (like the front, back, and trunk). The Bluetooth feature is my favorite and works flawlessly. I have not had any issues mechanically and every tune-up (like oil changes) have gone well. Local maintenance shops have the materials and supplies that are required. I do not know the specific gas mileage, however I feel satisfied with how often I need to fill up. I drove 120 miles a day for the first year for work. I never had any problems with the vehicle, it was super comfortable to ride for that long in, and it helped with winter driving. The AWD feature is one of the main things that attracted me to this specific car. Driving on the country roads in the middle of snowy winter can be dangerous and causes me significant anxiety. My car performed better on ice and snow than my friends who also drove that far daily. In fact, many days we carpooled because of the great winter driving my car does! It definitely made us feel safer. Also, whatever material is on the seats has saved my life. I am a chronic coffee spiller and you cannot even tell on my grey fabric seats. They are easy to clean and appear very stain-proof. Everything I could ever need! I love the fact that my car is not a huge SUV but is still able to seat 7 people. The third row is great for company. I love how I can lay down all the seats to make room for hauling things. I like the backup camera so that I can park without worry. I like how the screen tells me which tire is in need of air and the exact pressure measurement on each tire. I like the seat warmers and the Bluetooth controls. I like how there is a temperature control for the heat and ac in the back third row. I like how safe I feel the car keeps my family and so. I could go on and on! Hyundai changed the body style after I bought it, but it is not that different. No issues with the car itself. I was a little upset that the satellite radio in the car works for XM channels only. Believe it or not, there are some Sirius XM channels that only broadcast to certain "brands" (I. E. , either Sirius or xm) radio models. It is very reliable, and I love the Bluetooth capability. My favorite feature is the air conditioned and heated seats and the heated steering wheel. You would be surprised how nice it is to have a heated steering wheel in the winter, and the air conditioned seats are a lifesaver during the hot summers!